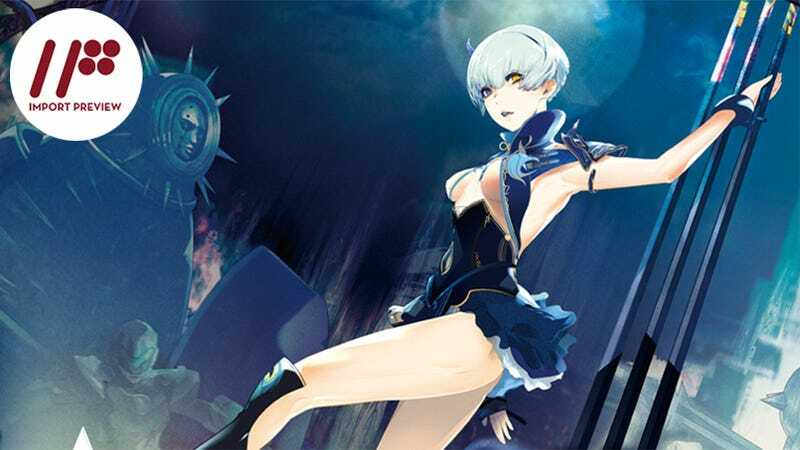 In Deception IV: Blood Ties, the latest game in the Deception series, you play as a demon princess whose castle is constantly being invaded by various groups of heroes. Fighting them off requires the careful placement of brutally violent traps that will have you feeling like a sadistic monster in no time flat. In Deception IV, you are not able to attack the heroes directly and instead must summon traps and lure them in, using yourself as bait. While you can lure them into traps one by one, this does little damage and awards little in the way of money and EXP. The way to get tons of both is to create a chain of traps, throwing the heroes from one to another like the world’s most violent Rube Goldberg machine. You have three types of traps to use: damage-dealing traps like buzz saws and walls of spikes; movement-affecting traps like bear traps or spring-loaded floors; and joke traps like rakes or banana peels that effect movement or do damage in silly (read: sadistically slapsticky) ways. Which traps you bring into battle is completely your choice; and based on the type of traps you use, you’ll unlock more and more of that type. Each trap is attached to the floor, ceiling, or wall and no two traps can take up the same space—though having one on the floor and one on the adjoining wall causes no problems. When chained together properly, you can produce some absolutely stunning combos that kill even the strongest enemies—all accompanied by the sounds of your own sadistic, triumphant laughter. As you are the bait, a lot of the skill in playing the game is in positioning yourself in such a way that you can lure your enemies into your traps without being killed in the process. Often this is harder than it sounds. Many enemies are immune to various traps and some even learn to avoid certain traps after being caught in them once. But more than that, you can get caught in your own traps as well—you are in no way immune to them. In fact, most of the time when I play, this is how I get hurt—not because of the enemies’ attacks. Sometimes I think I am clear of a trap when I’m not. Other times it just seems worth it to get hit so as to take a particularly elusive foe with me. It still makes me feel like a moron each time it happens, though. While setting up your traps in a good chain is important, so is the room you are in. Each room in the game has its own hazards you can chain together with your traps. Sometimes it is a one-use hazard like a falling chandelier or capture cage. Other times it is something that can be used over and over again like a turning gear or a cannon. But the best thing about the layout of the game is that just because you start in a room doesn’t mean you have to stay there. Most levels of the game allow you to leave the room you are in and go to several others in the castle. This allows you to pick your own battlefield—to choose a room where the traps you have equipped will be the most useful. And more often than not, one of your three demonic minions will have optional mission objectives for you that require you to go to a certain room and kill someone in a specific way. This really helps to change up the gameplay. If the story mode starts to get too tough, you always have the option of leveling up (i.e., gaining money and EXP to unlock new traps) in the mission and/or free battle mode. The mission mode functions somewhere between an extended tutorial and a puzzle game. You are given a certain set of traps in a pre-chosen room and are then given an objective that defines how you must kill the hero(es). It serves to teach you new and creative ways to use your traps as well as lets you test out traps you may have not unlocked in the story mode. The free mode lets you choose any room and set of enemies, and you simply go to town on them. It’s good practice for the story mode and lets you recreate some of the game’s tougher fights. The most important thing in a game like Deception IV is balancing variety with logic. However, the way different traps react together is often unpredictable—what seems like a working combination is not. For example, shooting a giant buzz saw into a hero whose leg is caught in a bear trap rips him out of the bear trap and carries him all the way to the far wall. However, if the hero is instead racked on a painfully pointed pommel horse, the buzz saw blade simply despawns when it hits the hero, doing no damage. Set piece hazards are equally finicky. Why is it that knocking a person into a rack of weapons impales him but pushing him into it with a saw blade makes the weapons rack act like it is a flat wall? It is incredibly frustrating when you see something that should work logically and yet it doesn’t. And unfortunately, since this happens repeatedly, it makes you want to stick with something that works once you find it and no longer experiment. That's the worst possible feeling to impart to a player in a game like this which is all about creativity. When it’s playing like it should and your enemies are being thrown from trap to trap as you laugh in malicious ecstasy, Deception IV: Blood Ties is a lot of fun. However, when things don’t work as they should and you don’t know why, the game becomes more than a bit frustrating. Still, the fun moments tend to outweigh the frustrating ones; and if you like Rube Goldberg machines, tower defense games, and/or have a twisted sense of humor, this is definitely a game you will enjoy. Deception IV: Blood Ties was released in Japan for the PlayStation 3 and PlayStation Vita on February 27, 2014. It will be released on March 25, 2014, in the US and March 28, 2014, in Europe.